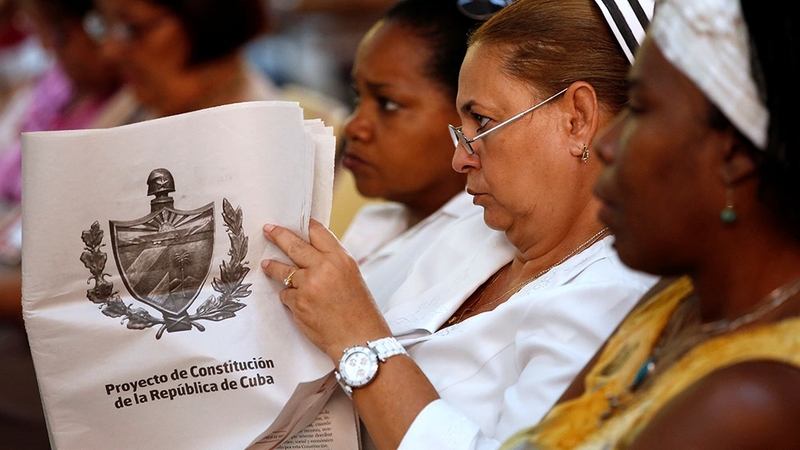 Nearly 87 percent of Cuban voters approved a new constitution that preserves the island’s single-party socialist system and centrally planned economy while updating some financial, electoral and criminal laws, authorities said Monday. Cuba’s National Electoral Commission said 7,848,343 people voted Sunday on the new charter, which was widely promoted as a vehicle for continuity in one of the world’s last communist nations. The commission said 6,816,169 people voted in favour of the new constitution. Some 300,000 votes were counted as invalid because they were blank or defaced, while 706,400 people voted against the new constitution. The new constitution recognises private and cooperative businesses alongside state ones, creates the posts of prime minister and provincial governor, and introduces the presumption of innocence and habeas corpus to the justice system. It also sets term limits for the president. But Carlos Saladrigas, a Cuban-American businessman and head of the Cuban Study Group, which advocates enagement with Cuba, said the consitution is “another big missed opportunity”. “The few important economic changes made are not sufficient to create economic growth and attract foreign investment in the needed quantities,” he told Reuters news agency. The largest block of “no” votes was expected to come from the growing ranks of evangelical Christians in Cuba, who object to language that eliminates a requirement for marriage to be only between a man and woman, paving the way for a future legalisation of gay marriage.